Police say alleged gang members in the 'satantic' killing of teen held three girls captive. HOUSTON (KTRK) -- Houston police say alleged Satan-worshiping MS-13 gang members kidnapped at least three girls, killing one of them. They are investigating whether a missing Jersey Village teen was the victim who was murdered. In January, Jersey Village Police took a report about a missing girl named Gemesis Cornejo. Then two weeks ago, 15-year-old girl was found fatally shot in the head and stomach on the side of the road in southwest Houston. The description of the missing girl matched the murdered girl, but police have not confirmed that she was the victim of the 'satanic' killing. Miguel Alvarez-Flores, 22, and Diego Hernandez-Rivera, 18, are charged with her murder. 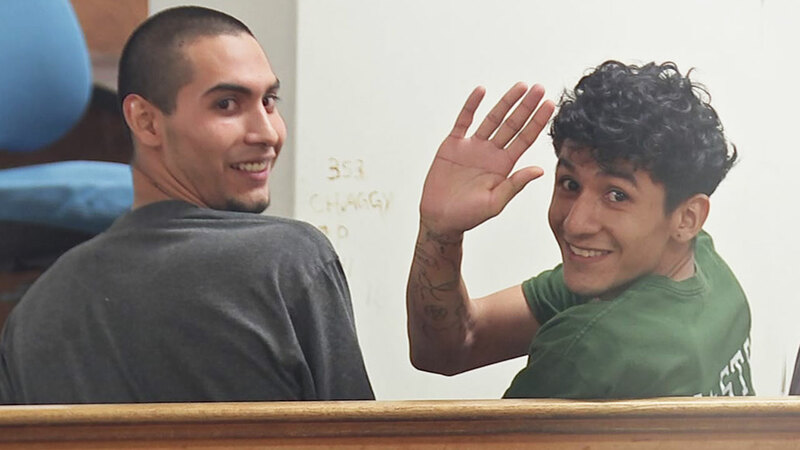 During their first court appearance, they smiled and waved at the cameras. There's no word on the connection between the three girls and the gang members. Investigators would not comment on the circumstances of how the girls were kidnapped and why. The two girls who survived the kidnapping have been reunited with their families. The 14-year-old was able to lead police to Alvarez-Flores and Hernandez-Rivera. A prosecutor says Hernandez-Rivera admitted to shooting "Genesis."